The Scottish Rugby Union’s Caledonia Regional Youth Finals day will be held at Station Park, St Andrews this coming Sunday. Amongst those competing will be Madras U15s who are set to face Stirling County. The journey has been a tough road for the local boys rugby side. 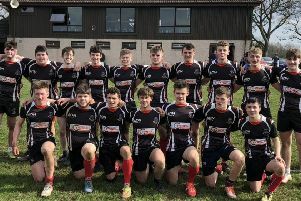 Following tough qualification matches with wins over Dunfermline, Perth and Aberdeen, Madras Rugby Club U15s are up against Stirling County, one of the country’s top club sides, in the cup final, the premier competition in the U15 age group. Madras club president Craig Bones said: “Reaching the cup final is a fantastic achievement for the boys and follows on from all their efforts and endeavours training with the club ever since primary three. The U15 team encompasses players from across the whole of north east Fife, many of them playing together as a group for some years. “To reach the final of this cup competition is a magnificent achievement in their first real taste of competitive rugby,” added Mr Bones. Sunday will see a festival of youth rugby with the day being hosted on behalf of the Scottish Rugby Union by Madras Rugby Club. Parents from across all age groups of the club have helped to support the day and offered their full support to make the event a success for the SRU. Madras U15s kick off at 2pm on pitch three in the cup final.